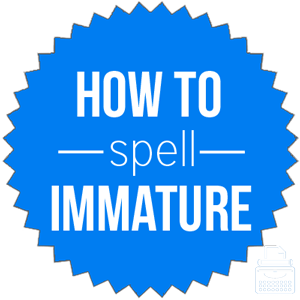 Spelling of Immature: Immature is spelled i-m-m-a-t-u-r-e. Definition of Immature: Immature means the lack of complete growth or development. It also refers to someone who exhibits a lower level of maturity than expected. Pronunciation of Immature: Immature is pronounced two different ways: im-a-chur and im-a-toor. What does immature mean? Immature is an adjective most often used to describe someone who acts in a childish or less mature way than expected of their age. It also refers to something or someone that is not fully developed, grown, or ripe. The teacher expressed his concerns about the student’s immature behavior to the student’s parents. Beside the full and blooming plant stood its immature offspring, barely half the size. The adverb, immaturely, is formed by adding “-ly” to immature. Immaturely describes one’s action(s) as being immature or childish. He immaturely mocked and imitated the younger students before laughing and walking away with his friends. She behaved immaturely the entire time so she will not be coming to another performance with me until she can act her age. The noun is formed by dropping the “-e” and adding “-ity” to the end of immature. We broke up due to his extreme immaturity for his age. The first known use of immature was in 1548, according to Merriam-Webster’s. This word comes from the Latin word immaturus, in-, not, + maturus, meaning mature. There are several synonyms for the word immature. Depending on which definition of the word is intended, there are different words from which to choose. However, there are a few words that can be used for both. Immature is an adjective used to describe someone or something that is not fully grown or developed, or someone who acts childish and without a normal level of maturity.